Many hams will be baked this holiday season, generating many pounds of leftover ham. Much of that ends up on a simple ham sandwich. Here’s an alternative: Make your sandwich on a biscuit. It’s that much more special. We enjoy this recipe with breakfast eggs and aslunch with a salad. The recipe was developed by Dietz & Watson, which used its Chef Carved Ham. If you don’t want to make the cranberry balsamic reduction, default to mustard and plain cranberry sauce. Similarly, you can make biscuits from scratch or buy refrigerator biscuits. 2. MAKE cranberry balsamic reduction while the biscuits bake. Combine preserves, vinegar, basil, mustard, peppercorns and chile in a medium sauce pan over medium heat. Simmer the sauce until thickened (approximately 8 to 10 minutes). Strain the reduction through a fine sieve and if needed, thin with water. 3. 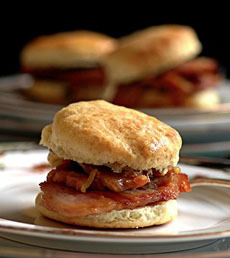 TEAR ham to fit biscuits. 4. HALVE freshly baked biscuits and place ham on the bottom half. Drizzle reduction over the ham and cover with biscuit half.